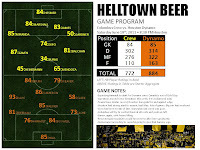 The Columbus Crew take on the Houston Dynamo this weekend in what is gearing up to be a mystery match. In reading around the Dynamo sites, blogs and papers I noticed something; Their fans are not problem pointer outer folks. More supportive in many regards then (maybe only a few vocal) Crew fans. I'm speaking generalities here, so take that for what you will but some may see it as refreshing to see a fan base being, well, fans. But Houston is not Columbus. Columbus is located near a part of the country that has run out of patience and is not interested in accepting mediocrity or failure. It's a place where the fire burns as hot during the 3rd shift as it does 1st. Poor results are met with sharp fangs and deadly venom. Win or be eaten alive. Buried, whilst still breathing. Then dug up again and munched on again. They might not know it, but many fans here expect what my beloved Stoke Upon Trent fans expect. Give 100% regardless of talent. Damn the blue bloods. Lose a limb out there? Toss it off the pitch and carry the hell on. The Crew logo is audaciously designed with three men wearing hard hats. I work in the manufacturing industry up here with over 200 folks working their asses off all day, every day and incidentally, it's not more then a mile away from where the Crew trains. Live up to that logo or change it to Limited models wearing the latest fashionable trends. Heck, The Limited could fill a catalog full of injured Crew players wearing their clothes. They are based up here aren't they? I just read that Tom Heinemann is getting pegged to start with Mendoza up front this weekend. Turn them loose and give the Dynamo something to worry about. 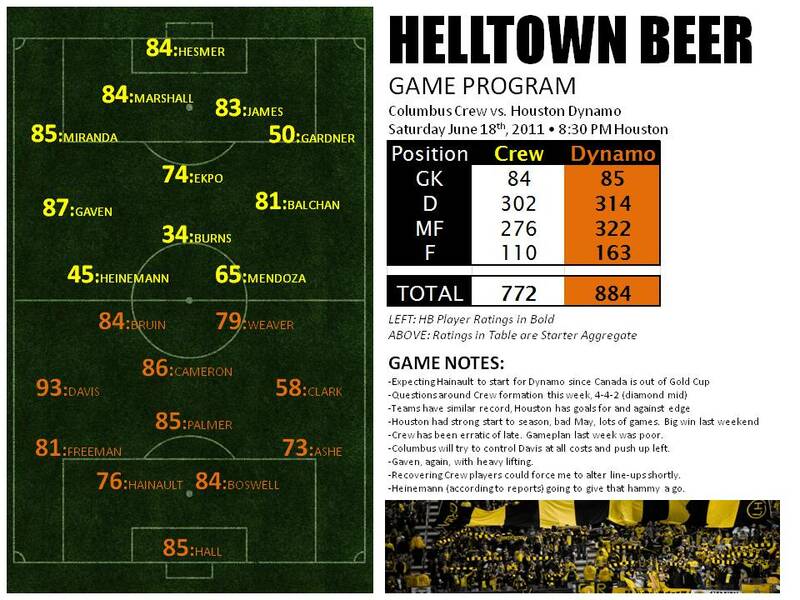 Houston is likely to come out in a similar formation as the Crew. The Chicago Fire absolutely jammed the Crew last weekend and exposed what's becoming a tactically weak Columbus. The approach Chicago came with is not expected from Houston. As in, tactically they nearly mirror Columbus. Both teams are coming off frustrating extended month of May and mixed early June results. Unless the Columbus staff makes a drastic formation change look for this one to be more open with both teams pushing and desperately looking for goals and three points. Editors note: This post is to be read at your own risk with a pint of IPA and listening to Akron, Ohio's own - Black Keys.